Background: Growth factor receptor-bound protein 2 (Grb2) is a 25 kDa adaptor protein, which was originally discovered to accomplish basic cellular events such as cell growth, cell proliferation, and metabolism. However, recent studies evidenced that Grb2 was largely involved in multiple tumor malignancies. The mature Grb2 is a 217 amino acid sequence, which consists of one Src homology 2 (SH2) domain flanked by two Src homology 3 (SH3) domains. Using these binding motives, the ubiquitously expressed Grb2 acts as an intermediate between cell-surface activated receptors and downstream targets. Objectives: Consequently, the Grb2 becomes the key element of this oncogenesis and launched a number of defected signaling cascades. Therefore, vast concern of the Grb2 in multiple cancer patterns makes it an attractive therapeutic target. In this review, we have compiled the maximum tumor conformations caused by the involvement of the Grb2, the central role of Grb2 in numerous oncogenic pathways and particular approaches that can be useful to downregulate the Grb2 overexpression. We will discuss in details the activity of different types of novel peptides, their high affinity for the Grb2 protein and blockade of Grb2 mediated signaling pathways by targeting the SH2/SH3 binding sites. 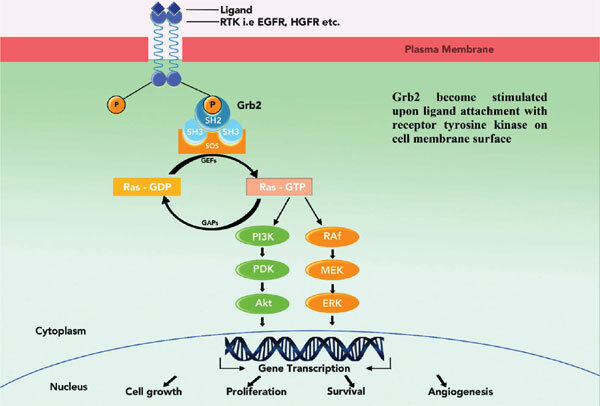 Methods & Results: There is a three-fold aspect to this review: Grb2 protein introduction, Grb2 protein involvement in cancer, and the role of peptides as Grb2 antagonists. First, Grb2 and compiled maximum tumor conformations induced by Grb2 involvement were introduced. Secondly, several oncogenic pathways of Grb2 involvement and particular approaches potentially useful to downregulate Grb2 overexpression were outlined. The activity of different types of novel peptides for the Grb2 protein was also detailed. Last but not least, the blockade of Grb2-mediated signaling pathways by targeting SH2/SH3 binding sites were summarized. Conclusion: We have epitomized the utmost cancer malignancies caused by abnormal signaling of the Grb2 adaptor molecule. Indeed, Grb2's enormous involvement in the progression and development of different cancers broaden our tactics to build anticancer drug candidates. Depending on the high affinity and increased specificity we have described the major potent peptides which may efficiently target and block the SH2 or SH3 arms of the Grb2. It may be of benefit for developing novel anticancer peptides. However, further work is needed to pinpoint more binding motives of Grb2 to generate efficacious anticancer agents for diverse human cancers in the near future. Keywords: Growth factor receptor-bound protein 2 (Grb2), SH2 and SH3 domains, MAPK, cancer, peptide, signaling pathways. Keywords:Growth factor receptor-bound protein 2 (Grb2), SH2 and SH3 domains, MAPK, cancer, peptide, signaling pathways. Abstract:Background: Growth factor receptor-bound protein 2 (Grb2) is a 25 kDa adaptor protein, which was originally discovered to accomplish basic cellular events such as cell growth, cell proliferation, and metabolism. However, recent studies evidenced that Grb2 was largely involved in multiple tumor malignancies. The mature Grb2 is a 217 amino acid sequence, which consists of one Src homology 2 (SH2) domain flanked by two Src homology 3 (SH3) domains. Using these binding motives, the ubiquitously expressed Grb2 acts as an intermediate between cell-surface activated receptors and downstream targets.